Chagatai Khan: Imran Khan & Jamat-e-Islami VIOLATE Blasphemy Law. 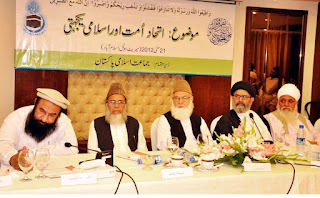 Imran Khan & Jamat-e-Islami VIOLATE Blasphemy Law. Barelvi Scholar declares that "Dobandis and Wahabis" are KAFIR. Ayatollah Ruhollah KhomeinI was not an easy man. Stern and vengeful, he was not an easy man to like. Single-minded in his thinking, he was not an easy man to negotiate with. He certainly was not an easy man to interview. I remember the second time I interviewed him, in his exile in a village outside of Paris in the months before the 1979 revolution. He didn't like one of my questions. So he simply stood up from his cross-legged position on the floor and, without a word, wrapped himself in his cloak and left the room. Yet during his lifetime the ayatollah achieved near-mythic status, and he was revered, even worshiped, by Iranians who saw him as their savior on earth. Night after night before the revolution, many people swore that they saw Khomeini's face -- his turban, his eyes, his nose, his beard -- in the moon. In his biography of Khomeini, Baqer Moin describes the harsh side of the cleric who forever changed the course of Iran's history. ''Khomeini had never been particularly interested in discussion and dialogue,'' Moin writes. ''He was an introvert; his dialogue was with himself rather than with others.'' But then Moin, correctly, finds the key to understanding the ayatollah elsewhere: ''His approach was intuitive.'' It was Khomeini's extraordinary intuition, his innate sense that a cleric should be more than a person who leads prayers every Friday and conducts rituals for pay, that propelled him to lead a country into one of the most far-reaching revolutions of modern history. True, Khomeini was a man of religion; but even more important, he was a gifted and shrewd politician, skilled in mobilizing his supporters and isolating his opponents, supple in decision making when it served his goal of making and consolidating a theocracy. He appealed to the masses with promises to liberate them from oppression, surrounded himself with loyal clerical lieutenants and attracted the religious bazaar merchants, who began to offer him money, which in turn increased his following and influence. And he had no patience with the clerics of his day, even his more senior peers, who were determined to stay out of politics and were willing to share power with a traditional Shiite monarchy as their predecessors had done for over four centuries. ''Politics and religion are one,'' Khomeini often declared. 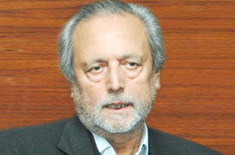 Baqer Moin is ideally placed to have written a biography of one of the most complicated political figures of the 20th century. Moin grew up in Iran, where he learned Persian and Arabic poetry, mysticism and philosophy from his father, who was trained as a cleric but earned a living as a farmer. Moin himself studied in the religious seminaries of Mashad before becoming a journalist. He now heads the BBC's Persian service (even Khomeini listened to it). Moin has produced the first serious and accessible examination of the ayatollah's life. The most interesting parts of the book deal with the human side of a man who was little known before his ascent to power and widely misunderstood both before and after. Born into a family of clerics descended from the prophet Muhammad, Khomeini enjoyed a comfortable childhood in the village of Khomein in central Iran, where he was raised in a large fortified compound with a vast garden, courtyards, balconies and watchtowers. He was cared for by servants and protected by armed guards. As a young man, Khomeini developed an interest in poetry and wrote poetry himself, even using the language of love and drink. (''Keep the door of the tavern open for me night and day, / Farewell seminary, farewell mosque, / Let me go my way'' was typical of his style of verse.) Later, dissatisfied with the orthodox version of Islam practiced by the clergy, Khomeini became an intellectual rebel, plunging into mysticism. 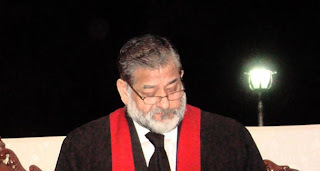 Moin argues that he owed his fearlessness as a political leader to his mystical sense of oneness with God. ''Intoxicated by the cosmic vision of a mystic and bound by the firm belief of a jurisprudent who carries out God's command, Khomeini the politician was a powerful fusion. As a mystic, Khomeini was an elitist, but as a theologian he was expedient and as a politician a calculating populist to the point of being opportunistic. . . . For Khomeini, there was no distinction between the persona of the jurist, the mystic and the politician.'' In his first news conference in Iran, four days after his return in February 1979, he unveiled the world's first modern theocracy. ''This is not an ordinary government,'' he declared. Rather, it would be ''God's government.'' That meant, he added, that opposition to the government was opposition to God -- in other words, ''blasphemy.'' Moin evokes Khomeini's rigidity through the memories of his host in Turkey, where Khomeini lived for several months in 1964 after the shah sent him into exile. When Ali Cetiner, a Persian-speaking colonel in Turkish military intelligence who was assigned to be Khomeini's minder, couldn't find a suitable place for him to stay he took him into his secular middle-class home in the city of Bursa. Cetiner's wife installed a new bed, bought new sheets and even put a Koran at Khomeini's bedside. She cooked dinner and put on her best dress to greet their Iranian guest. But when Khomeini arrived, he began protesting to Colonel Afzali, the minder from Iranian intelligence who had accompanied him there. ''He says the woman with the uncovered head should leave,'' Afzali explained to Cetiner, whose wife replied: ''I am not his housekeeper here. I am the lady of the house.'' Still, she put on a long nightdress and covered her head. Over time, Khomeini came to respect her, standing up when she entered the room, chatting with her amiably and even smiling as he looked her in the eye. Moin provides a deft account of Khomeini's emergence as a political leader: his writings, the dissemination of his ideas through audiocassette tapes while he was in exile in France and Iraq, his triumphal return to Iran, the hardening of his positions after the revolution. But some of the central chapters in recent Iranian history receive only the most cursory treatment. One of those chapters was the 444-day seizure of the United States Embassy in Tehran, which Khomeini blessed and then used to consolidate his power and purge his enemies. Another was the Iran-contra affair, in which the United States secretly sold weapons to Iran in violation of its stated policy and used the profits to finance anti-Communist rebels in Nicaragua. Iran's purchase of weapons from the country Khomeini assailed as the ''Great Satan'' underscored the regime's pragmatic streak. A third was Khomeini's ambitious but unsuccessful campaign to export his version of Islamic revolution to the rest of the Muslim world. Still, Moin does capture many things well -- for instance, Khomeini's antipathy to Israel. The Ayatollah's early writings and sermons have a distinctly anti-Semitic tone, which he muted as he became more of a political leader. 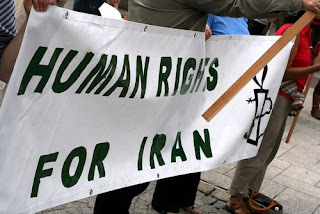 Yet even today, Iran views the United States and Israel as enemies and is uneasy with its Jewish population, as demonstrated by the recent closed trial of 13 Jews on charges of spying for Israel. Not that Jews are the only victims of intolerance in Iran. As Eliz Sanasarian points out in her short but indispensable study, ''Religious Minorities in Iran,'' Iran has been uncomfortable with its other minorities as well, including the Zoroastrians, the Bahais, the Armenians and other Christians, and has repressed and marginalized them to varying degrees over the years. Sanasarian's book is an important contribution to understanding the relationship between Iran's religious minorities and the Tehran government. 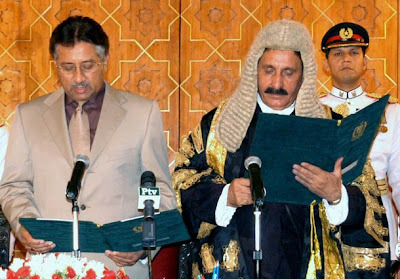 Tragedy with Pakistani Political Class is that they never break free themselves from the shackels of Religion in our case Islam. 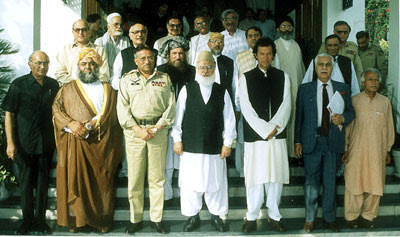 Mawdudi all his life indulged in Dirty Power Politics but in the name of Islam, Bhutto in the end in his Jail Cell asked for Rosary Beads and became Sufi and put that rosary beads around his neck, Benazir Bhutto, Nawaz Sharif, Asif Ali Zardari from time to time needed the support of Dam Jhaar [a kind of Magic Muslim Sufi do] so much so Pervez Musharraf and even that Rascal General Zia needed the help of Sufis for Dam Jhara and not a single Ruler succeeded in getting any benefits. Politics should be free from any kind of Religion. What we have here that Mr Altaf Hussain while sitting in LONDON, UK since more than 10 years having British Passport, giving Pakistanis the glad tiding of the Revolution like Khomeini brought in without realizing that Altaf Hussain had himself sacked Aamir Liaquat Hussain from MQM for declaring that Salman Rushdie should be killed [I wonder if Altaf Hussain remembers that the Fatwa was issued by Khomeini and Salman Rushdie was British Subject like Mr Altaf Hussain]. "Here is a glimpse this Ruthless Khomeini and equally Ruthless Regime"
CHILDREN as young as 13 were hanged from cranes, six at a time, in a barbaric two-month purge of Iran's prisons on the direct orders of Ayatollah Khomeini, according to a new book by his former deputy. More than 30,000 political prisoners were executed in the 1988 massacre - a far larger number than previously suspected. Secret documents smuggled out of Iran reveal that, because of the large numbers of necks to be broken, prisoners were loaded onto forklift trucks in groups of six and hanged from cranes in half-hourly intervals. 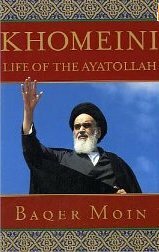 Gruesome details are contained in the memoirs of Grand Ayatollah Hossein-Ali Montazeri, The Memoirs of Grand Ayatollah Hossein Ali Montazeri, one of the founders of the Islamic regime. He was once considered Khomeini's anointed successor, but was deposed for his outspokenness, and is now under house arrest in the holy city of Qom. Published privately last month after attempts by the regime to suppress it, the revelations have prompted demands from Iranian exiles for those involved to be tried for crimes against humanity. The most damning of the letters and documents published in the book is Khomeini's fatwa decree calling for all Mojahedin (as opponents of the Iranian regime are known) to be killed. Issued shortly after the end of the Iran-Iraq war in July 1988 and an incursion into western Iran by the Iranian resistance, the fatwa reads: "It is decreed that those who are in prisons throughout the country and remain steadfast in their support for the Monafeqin (Mojahedin) are waging war on God and are condemned to execution." It goes on to entrust the decision to "death committees" - three-member panels consisting of an Islamic judge, a representative of the Ministry of Intelligence, and a state prosecutor. Prisoners were to be asked if they had changed loyalties and, if not, were to be executed. Montazeri, who states that 3,800 people had been killed by the end of the first fortnight of executions, includes his own correspondence with Khomeini, saying that the killings would be seen as "a vendetta" and would spark opposition to the regime. He wrote: "The execution of several thousand prisoners in a few days will not have positive repercussions and will not be mistake-free." The massacres, which came just before the Lockerbie bombing, were seen as a sop to the hardliners at a time when Khomeini was already in failing health and the battle for succession had begun between fundamentalists and moderates. He died the following year. According to testimony from prison officials - including Kamal Afkhami Ardekani, who formerly worked at Evin prison - recently given to United Nations human rights rapporteurs: "They would line up prisoners in a 14-by-five-metre hall in the central office building and then ask simply one question, 'What is your political affiliation?' Those who said the Mojahedin would be hanged from cranes in position in the car park behind the building." He went on to describe how, every half an hour from 7.30am to 5pm, 33 people were lifted on three forklift trucks to six cranes, each of which had five or six ropes. He said: "The process went on and on without interruption." In two weeks, 8,000 people were hanged. Similar carnage took place across the country. Many of those in the ruling council at the time of the 1988 massacre are still in power, including President Mohammed Khatami, who was the Director of Ideological and Cultural Affairs. 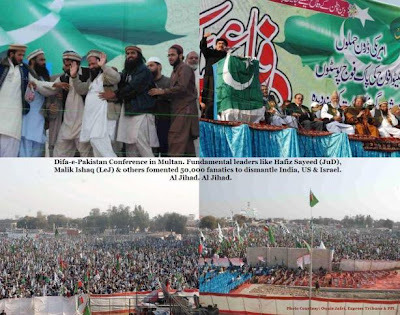 LAHORE: Chief of banned militant outfit Lashkar-e-Jhangvi Malik Ishaq was in attendance at the Difa-e-Pakistan Council rally in Multan, a spokesperson for the council’s member organisation Jamaatud Dawa has said. “General (retd) Hamid Gul was wrong in denying Ishaq’s presence at the rally. He was present on stage,” said Yahya Mujahid, a spokesperson for Islamic chairty, which is blacklisted by the United Nations for its alleged ties to LeJ but not by the Pakistan government. Gul, in an interview with Express News television channel, had categorically denied that Ishaq was present at the rally. “It was DPC’s unanimous decision that Ishaq will not address the rally,” Mujahid told The Express Tribune on Friday. 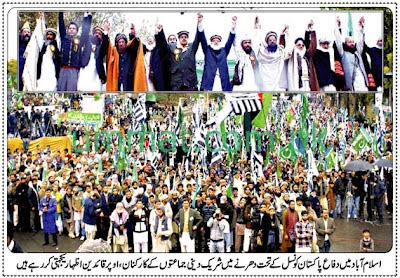 “It’s a simple rule that whoever addresses the people from stage at a DPC rally cannot be a member of a banned militant outfit.” Mujahid was attending an emergency protest, called by the JuD outside their main mosque Jamia Qudsia in Lahore under the DPC’s banner, against resumption of Nato supply routes and trade talks with India. The council has also called a meeting of heads of member parties on February 19 in Islamabad. 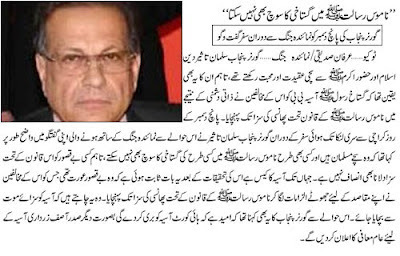 Ansar Abbasi & Vulgarity on GEO TV of Jang Group. A K Hangal, Bal Thackeray & Syed Talat Hussain. Blasphemy Law & Use of Violence. Misuse of Blasphemy Law on Non-Muslims & Muslims. Ansar Abbasi & Vulgarity / Obscenity. 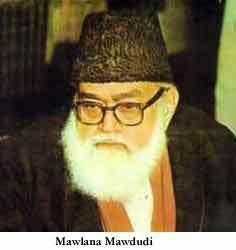 Qazi Hussain Ahmed quotes Blasphemous Mawdudi. Blasphemy Law & Blasphemous Jamatud Dawa/DPC.